The children were thrilled to spend the time surrounded by creativity: rehearsing, creating the decorations and the puppets. Everyone was both excited and nervous for the opening of the show, but also sad that it meant the end of the camp and their time with their creative wonderful teachers. It was great that the children got to experience every step of putting together a show: they themselves created the puppets, prepared the decorations, acted, created the program, participated in a little pre-opening night ritual, overcame the jitters of their first night acting and received bouquets of flowers after the show...The 8 days were productive: children started using new Lithuanian words, learned to appreciate the importance of honesty, friendship, hard work and the results of creativity. 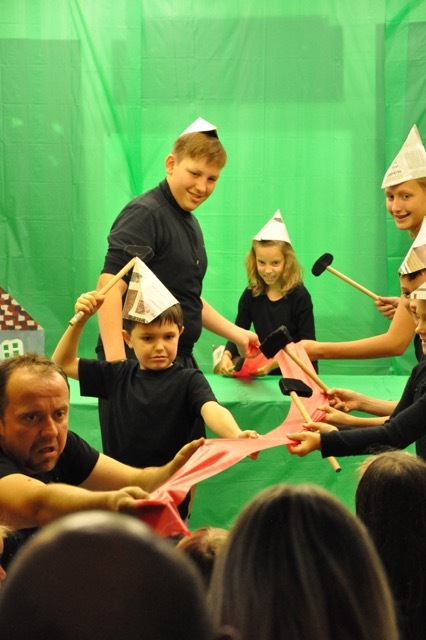 We all want to thank the actors Andrius Žiurauskas and Indrė Taločkaitė from the Kaunas Puppet Theater and our theater teacher, project ,,Žaidžiame teatrą" coordinator, Skirmante Granickaitė, for wonderful experiences. Vilnius Lithuanians' House Education for Lithuanians Abroad Center congratulates the school with the new year.